Our wholesale program is reserved for qualified, licensed trade partners. Here we offer special design resources and support, engineering specs, and trade pricing. 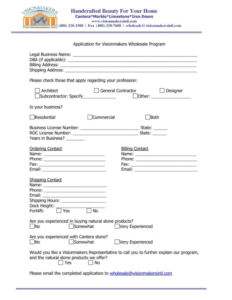 To join our wholesale partnership, please fill out the application to your left. A Visionmakers representative will contact you within 48 hours to discuss the program, and answer any questions you have. Are you experienced in buying natural stone products? Are you experienced with Cantera stone? Would you like a Visionmakers Representative to call you to further explain our program, and the natural stone products we offer? Copyright © 2019 by Visionmakers International • All Rights Reserved.